Big tobacco, meet Canadian cannabis. Altria Group Inc., the maker of Marlboro cigarettes, has struck a deal to buy a large stake in Cronos Group Inc., a cannabis grower in Toronto. Richmond, Va.-based Altria said Friday in a media release that it agreed to pay $2.4-billion to acquire a 45-per-cent stake in Cronos. The agreement also includes a warrant that, if exercised, could see Altria’s ownership rise to 55 per cent for another $1.4-billion. The first Canadian cannabis grower to list its shares on a U.S. stock market, Cronos said it plans to spend the money on product innovation, noting Altria’s expertise in device technology and automation, and fuel Cronos’s expansion into new countries amid a global shift toward loosening restrictions on the drug. “This is a huge validation of the industry and our model,” Mike Gorenstein, chief executive at Cronos, said by phone. “This is just another stamp of approval that there is a huge opportunity in cannabis and that it is a legitimate industry." The deal marks the entry of another consumer-goods giant into Canada’s legal cannabis industry. Constellation Brands Inc., maker of alcoholic beverages, has invested more than $5-billion for control of Canopy Growth Corp., while Molson Coors Brewing Co. is looking to create cannabis-infused beverages through a joint venture with Quebec’s Hexo Corp.
Altria’s entry could also help restore confidence in Canada’s nascent cannabis sector. Canadian pot stocks have been crushed in recent weeks after a lacklustre start to recreational sales amid reports of countrywide supply shortages. This week, Aphria Inc., one of the country’s largest cannabis growers, was defending itself against accusations of striking deals to enrich insiders made in a widely read short-sellers’ report. Investors, meanwhile, have been pouring money into cannabis companies that operate in multiple U.S. states, pivoting away from Canada. Cronos’s stock closed 22 per cent higher at $17.06 in Toronto, while shares of Altria fell 0.4 per cent. “We believe an investment of this magnitude provides overall legitimacy to the industry as a whole and should represent a positive catalyst for the sector, with the news likely to drive valuations higher,” said Canaccord Genuity analyst Matt Bottomley, who has a 12-month price target of $9 on Cronos’s stock and a “hold” rating. Altria had been in talks with cannabis companies for months, as its core cigarette business continues to shrink. It also weighed making investments in other growers, such as Aphria and CannTrust Holdings Inc., according to sources familiar with the matter who were granted anonymity because the talks were private. Altria declined an interview request and didn’t speak on a conference call Friday held by Cronos. In a separate news release Friday, Altria said it is discontinuing its existing e-cigarette brands and will take a US$200-million charge on these assets in its next quarter. It said it was doing so because it doesn’t “see a path to leadership with these particular products,” as well as the regulatory burden it faces to bring them to market. Altria is in talks to acquire a stake in e-cigarette start-up Juul Labs Inc., according to reports by U.S. media outlets. 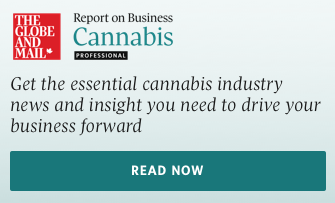 Cronos, meanwhile, grows and sells medical and recreational cannabis in Canada, operating two growing facilities in Ontario and one in British Columbia. It has entered into joint ventures to boost its presence and capacity in Canada and abroad, including in Israel and Australia. But Cronos is not among Canada’s largest cannabis producers – it generated just $3.8-million in revenue in its most recent quarter. Cronos plans to focus on cannabis genetics, innovation and branding, while contracting with farmers to grow the product and working with retailers. Altria shares that vision, Mr. Gorenstein said. Cronos has partnered with Boston biotech firm Ginkgo Bioworks Inc. to genetically engineer the active compounds of cannabis. Altria will nominate four directors to Cronos’s board, which will increase to seven directors from five. The deal is expected to close in the first half of 2019. JPMorgan Chase Bank NA, a subsidiary of JPMorgan Chase & Co., is providing financing to Altria. Bank of America Merrill Lynch financed Constellation’s deal with Canopy. There weren’t any Canadian-headquartered advisers involved in either deal. Canada’s top lenders, who have largely refused to serve clients in the cannabis sector for years, are now getting shut out of the sector’s biggest transactions. Cronos confirmed last Friday that it was in talks with Altria after a Reuters report. Short-seller Andrew Left of Citron Research, who has been a critic of Cronos and was betting against the stock going into Friday, said that this deal shows why Canadian growers trade at a premium to U.S.-based cannabis companies.